If you know anything about Porsche's original 911, you'll know that there was never a cabriolet version produced. Porsche, in the mid 1960s, was under the impression that American car market regulations would soon completely abolish the availability of completely open topped cars. In response to these regulations, Porsche produced the Targa model 911s and 912s from 1967 onward. The Targa has become synonymous with the 911 over the following half-century, and never went away. The Cabriolet model, on the other hand, was not introduced to 911 buyers until 1983 when it was obvious that the supposedly looming legislation was not coming. There were a handful of other times that Porsche attempted to evaluate an introduction of a 911 Cabriolet. The first evaluation was done in 1964, essentially by cutting the roof off of a coupe, as no folding top was ever fitted to that single prototype. This car was shown last year at the Pebble Beach concours as part of the 911's anniversary celebrations. The second time this idea was floated around the company, Porsche is said to have created a total of six cabriolet prototypes in late 1969 based on 1970 model year automobiles. This car is said to be one of those six. According to auction house Bonhams, the car is not officially recognized by the Porsche factory as having been a cabriolet prototype. That said, they also state that they have some information on the car that has been corroborated by Jürgen Barth and Jean-Pierre Cornu (both renowned as fountains of Porsche knowledge). Personally, I would want to have a very close look at this information, or perhaps hear straight from the mouths of Barth or Cornu that the car is what it is said it might be, before bidding several thousand dollars for the car. If the car is as represented, this could be a fantastic Porsche to purchase as the selling estimates range from $75,000 to $130,000. A quite wide range, but quite low if it truly is one of the six prototypes. The story goes that the six cars picked for "cabriolet-ization" were all 1970 Targa models that had been specially fitted with additional chassis bracing (note to self, as part of PPI check for said bracing and check for originality and authenticity). 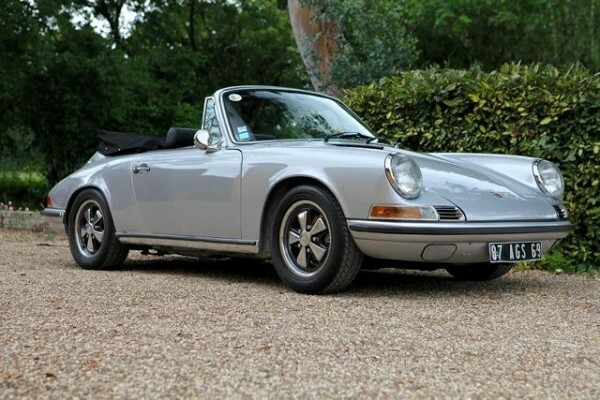 The car, the seller says, was returned to its configuration as a standard Targa after cabriolet testing was completed, and then subsequently sold. In 2004, this Porsche was in a sorry state. It had been fitted with big fender flares and a wing, among other stuck on body modifications. It was completely dismantled and prepped for a full restoration. During disassembly the car's special prototype parts were discovered and the restoration specialists determined they were working on something truly special. Once all of this came to light, and the research had been done, the choice was made to turn the Porsche back into a cabriolet using some custom fabricated parts. Since being restored a decade ago, the Porsche is said to have been cared for meticulously by the owner, and is described as still in very good/perfect condition. Accompanying documentation consists of expert Jean-Pierre Cornu's detailed condition report (dated 2007), many restoration invoices and French Carte Grise registration documents. If this is, indeed, a factory Porsche cabriolet prototype, then it is surely an excellent purchase. Being that it has not been recognized by the Porsche factory for authenticity, many enthusiasts and collectors will discard the car as no more than a heavily modified Targa and price it accordingly. Caveat Emptor, and all that jazz. If you determine that the provided documents are sufficient provenance, and the Porsche is worth the final bid price, then perhaps you will be the appropriate next owner for this unique early 911. If nothing else, I'll bet that 2.2 liter flat-six engine sounds fantastic with the top laid back. It sure is hard to beat driving down a tree-lined, back-country road on a sunny summer day with the wind rustling your hair. This Porsche will be up for sale at Bonhams' Zoute Sale this coming weekend, on the 10th of October, at the Knokke-Heist, Place Albert de Knokke Le Zoute in Belgium. Also featured are a pair of 356 Cabriolets, including one 'Rijkspolitie' Dutch police car. When I was having my 1960 356B Roadster restored in Central California,in the early 1990’s the body shop was also ‘modifying’ an early Targa into a Cabriolet. I was told there was no need for any additional bracing as the Targa was strong enough. Unfortunately, I never saw it finished nor kept up with it later.